Standardized testing is a practice through which tests are administered under a universal set of conditions that give all participants the same chances for success. These tests are designed and scored through the application of consistent guidelines, and test-takers all receive the same questions and time limits. Examples of standardized tests that students in the United States take include the Stanford Achievement Test (SAT-10), the National Assessment of Educational Progress (NAEP), and the SAT Reasoning Test. Since their inception within the education system, these tests have supplied data on how students compare state-wide and nation-wide with peers at the same academic level. While some education professionals find considerable merit in standardized testing, others express criticisms regarding the usefulness of these tests. In the US, standardized testing was introduced during World War I (1917-18), when intelligence tests known as the Army Alpha and Beta Tests were administered to groups of soldiers. Standardized educational assessments soon followed – the Scholastic Aptitude Test (SAT) was developed in 1926, and the American College Test (ACT) was introduced in 1959. Originally scored by hand, standardized tests were first scanned automatically in 1936 through the use of the IBM 805 computer. Public schools were mandated to utilize standardized testing in 1965 with the passing of the Elementary and Secondary Education Act. Rigorous standards are applied in the development of these tests in order to ensure that the results are accurate, valid, and reliable. The Joint Committee on Standards for Educational Evaluation has published three volumes that guide standardized test developers in producing quality assessments. These publications are known as The Student Evaluation Standards, The Personnel Evaluation Standards, and The Program Evaluation Standards (2nd edition). In addition to providing guidelines on the design of standardized tests, the three publications outline procedures for implementing these tests within educational settings. Standardized test series can differ from one another in design and in how their results are scored. Tests that are structured in a true/false or multiple-choice format are efficiently scored by computer. Assessments that involve essay questions or short-answer questions, each of which require hand-written responses, are scored by human evaluators who adhere to strict guidelines. Many standardized tests comprise a mix of these formats, necessitating the use of both machines and people to complete the scoring process. 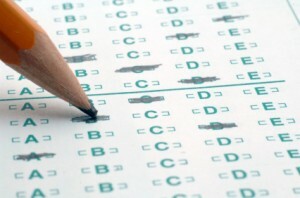 Standardized tests are advantageous for several reasons: they hold public schools accountable in terms of academic performance, they offer teachers insight on their students’ strengths and weaknesses in individual subjects, and they provide higher-learning institutions with an objective measurement of applicants’ abilities within the classroom. Because standardized tests are administered in a manner that places students on equal ground with one another, their results are generally more reliable than those of tests given under variable conditions. Conversely, the disadvantages of standardized assessments include the pressure felt by teachers to structure lessons around test material and the inability of the tests to measure a student’s creative thinking skills. Some critics argue that in certain instances, the assessments are not truly standardized, such as when test-takers with special needs require time limit or environmental adjustments. Standardized tests such as the SATs and the ACTs can have a big impact on the colleges you will be admitted to. The better standardized test scores a student receives, the more likely they are to get into a good college or the college of their choice. Colleges tend to rely heavily on standardized test scores during the admission process. While some schools are starting to rely less on standardized test scores, most of them still do so achieving high scores on the SATs and ACTs will help ensure that a student gets into a college of their choice. Standardized Testing Information For Parents – This information is for parents who have questions regarding the process of standardized testing in schools. Common Standardized Tests – This is a guide to standardized tests that are available to secondary, undergraduate, and graduate students in the United States. Effects of Standardized Testing Programs – This study examines the emotional effects of state-wide standardized testing on public school students and teachers. Measuring Standardized Tests – This essay, written by a Harvard University graduate professor, explores the strengths and weaknesses of standardized tests. Bias in Standardized Tests – In this article, a retired elementary school teacher offers her viewpoint on standardized tests and the inherent bias within. Pros of Standardized Testing – This essay highlights several key benefits that standardized testing can offer teachers and students. Testing Our Schools – This comprehensive guide, which is geared toward parents, provides information on the design and purpose of standardized tests. Facts About Educational Testing – These ten facts address both the limitations and the advantages of the standardized testing procedure utilized by schools. Descriptions of Standardized Tests – This page offers general descriptions of standardized tests such as the ACT, PSAT, and SAT. Accuracy of Standardized Testing – This essay discusses several elements of standardized tests, including accuracy, design, scoring, and purpose. Guide To Standardized Testing – Here, people can find information on types of standardized tests, formats of standardized tests, and the student assessment process. Standardized Achievement Testing Guide – This article offers parents tips on understanding the nature of standardized tests and interpreting test scores. National Assessment of Educational Progress – This is an overview of the National Assessment of Educational Progress (NAEP), a nationally-administered standardized test. Essays on Standardized Testing – This collection of essays explores topics such as state testing procedures, alternatives to standardized tests, and the challenges involved in testing students with disabilities.